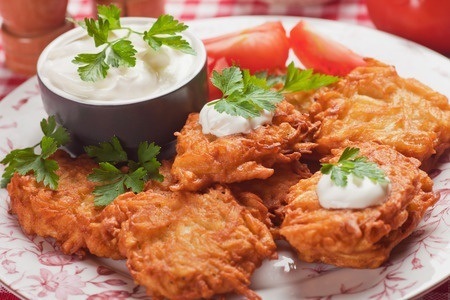 My first introduction to latkes, those little patties of fried potato deliciousness, came soon after my mother and stepfather got married. I don’t remember if it was our very first December as a family, or if it was a couple of years later, but I know that Bubbie (my stepfather’s mother) spent all day making them – one of the rare times she ventured into our kitchen for anything more than hot water. She peeled and shredded and fried for hours, and we got to eat the results. Now, I’d thought I knew what potato pancakes were, because my grandfather, pancake guru that he was, used to make pancakes that were either part mashed potato, or part leftover baked potato (whatever was available) mixed with regular batter. I remember loving it when I bit into a chunk of potato. But these were the real thing, the pure thing. Not just potato pancakes, but pancakes made entirely from potato (well, maybe a dash of milk, a bit of flour, seasonings, and an egg). The point is, I was expecting something more like the pancakes I’d grown up with, and less like a really tasty, far less oily (no, really) version of an Arby’s potato cake. Bubbie never made latkes for us again – from scratch. All subsequent acknowledgements of Hanukkah involved help from the nice people at Manischewitz and their onion-flavored mix (it comes in gluten free, too). We still had applesauce and sour cream, but there was a lot less work. Since then, I’ve made latkes from scratch exactly once, and let me assure you that once was absolutely enough. I cheated and used a food processor, but then, who wouldn’t? (I also had a minion who did a good portion of the peeling, showing off his skills with a paring knife in the process. Never, ever, try to make latkes for a couple of dozen people without the assistance of a minion. This is essential. I’m not Jewish, but that doesn’t mean I can’t like Jewish foods (I’m not Thai, Lebanese, Greek, Japanese, Chinese, Korean, Indian, French or Cajun either, but I like all of those foods – I’m a polyglot when it comes to cuisine. ), so last year I bought a couple of boxes of latke mix. I made some at home, and brought the rest with me when we went to visit my parents in Mexico. I don’t remember if it was Christmas night (because we’d had a huge brunch and weren’t hungry until pretty late at night), or one of the others, but we had a lovely late-night supper of latkes with applesauce, sour cream, and smoked salmon, while binge watching Call the Midwife on Netflix. I haven’t bought any mix this year, but I might, because potato pancakes are a flavor I really love, and even though it’s unseasonably warm, it is December. Tonight, in fact, is the first night of Hanukkah, which is why I’m writing about flipping lattes. (It’s way easier to do than making crepes.). Maybe I’ll even serve them with smoked salmon again. In the meantime, I’m nursing a cold, so I’m going to curl up in bed with tea and a good book.